Family law — We handle everything from simple, uncontested divorces to high-asset cases and complex military divorces. We help clients seeking custody of children, modifications of an existing order and custody contempt. We also handle stepparent adoptions and property division issues and disputes, as well as drafting prenuptial or postnuptial agreements and enforcing those agreements. Bankruptcy — We assist clients with Chapter 7 and Chapter 13 petitions. Criminal defense — Our lawyers defend those accused of DUI/DWI, drug possession and other misdemeanors, as well as juvenile law. Estate planning — We create wills, powers of attorney, living wills and special needs trusts. 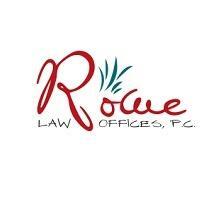 We guide clients through probate and more. Real estate — Our law firm handles residential transactions and litigation. Business law — We assist clients with business formation, transactions, contract drafting and review, litigation and more. Rowe Law Offices, P.C., is rated A+ by the Better Business Bureau, and we provide exceptional client service and return client calls promptly. We offer a free, face-to-face consultation with one of our lawyers, so that we can get to know each other and so that you can have questions and concerns addressed in a confidential setting. To arrange an initial consultation, call our Wyomissing office or our Lancaster office today. You will speak to a live person no matter when you call. †We are a debt relief agency. We help people file for bankruptcy relief under the Bankruptcy Code.